Well, it’s officially cold up here in the Northeast. And apparently winter doesn’t officially start until like December 21st or something, which coincidentally marks the end of the world… at least according to the Mayans…who I am frankly quite scared of. I mean, they have been right a lot, I’ve heard. Anyway, I sort of think is trash that winter doesn’t even START until December 21st. So not only is the world gonna end, it’s gonna end BEFORE Christmas, on the official first day of winter…which in my opinion should really be the day after Thanksgiving. Not the end of the world, the start of winter. You still with me? I mean, ending the world the day after Thanksgiving would seriously honk off those guys who were in line at Best Buy for 17 days before Thanksgiving. Which would kind of be hilarious, you know if the world weren’t REALLY ending. But Winter SHOULD start the day after Thanksgiving…right? Nobody asks my opinion when planning these things. Here’s my point. It’s cold here. And it’s already snowed. And I can’t feel Christmasy knowing it’s still fall. And since my mind is obviously not working at full capacity today, I will only be giving you half a recipe. You see those cupcakes up there? Well, I’ll tell you how to make half of it. Because I’ve already told you how to make the cupcakes. I’ve always wanted to try mixing in hot chocolate mix to frosting. It’s how my brain works. 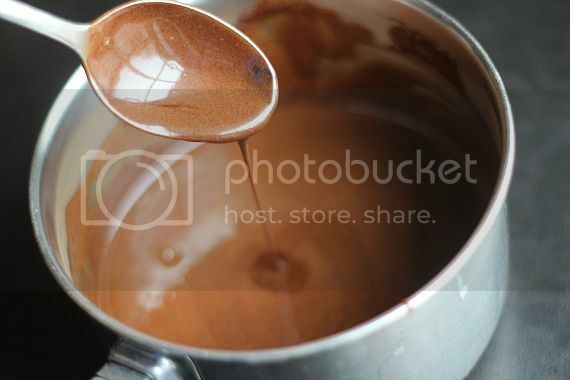 Just mix some heavy cream and hot chocolate mix in a small saucepan. Heat it up over medium heat and stir it until it’s almost boiling. In your mixing bowl, mix up some butter and add in some powdered sugar..
Pour that yummy, chocolatey cream into the frosting and mix it all together. I topped mine with some Jet Puffed Mini Marshmallows Bits. Again, chocolate cupcake recipe can be found HERE. makes enough to frost 12 cupcakes. In a small saucepan combine hot chocolate mix and cream. 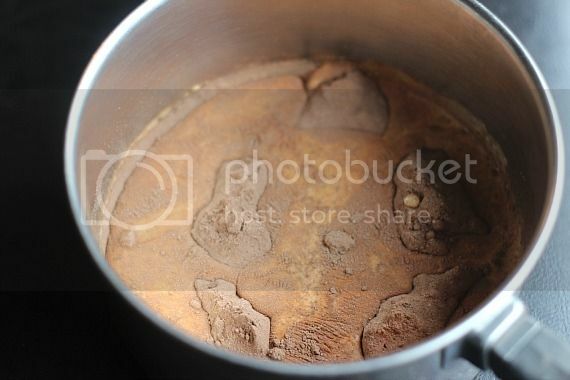 Heat over medium until hot and steaming…not quite boiling, stirring consistently. You want the sugar in the hot chocolate to dissolve. Set aside. In large mixing bowl cream butter until smooth. Add in powdered sugar and mix until combined. It will be very dry. Turn mixer to low and slowly pour in your hot chocolate mixture. Once all is added turn mixer up to medium and beat for about a minute until light and fluffy, scarping down sides of bowl when necessary. Spread or pipe on cupcakes. Dude I never thought to use hot cocoa mix in frosting because, yeah, it would be all grainy and gross. I would love to just have a huge bowl of this with a tiny bit of cupcake because the frosting IS the BEST part of a cupcake after all! And hot chocolate – so good! Oh my! I need to find a tiny cupcake pan to make “dippers” to go with dip ( I mean frosting)!! I agree. Winter begins the day after Thanksgiving. It’s still warm here, though. We even opened the windows today, which is super awesome but also weird. I’ve never been able to open my windows and have a Christmas tree twinkling nearby at the same time. So adorable!! And I just bought mini marshmallows which had never been at my store before. I think it’s a sign to make this for my boys. Looks delicious! I would so love to try some. I am sure it tastes amazing. These would be so cute for kids! I love those mini marshmallows! I agree the mallow bits are a must!! 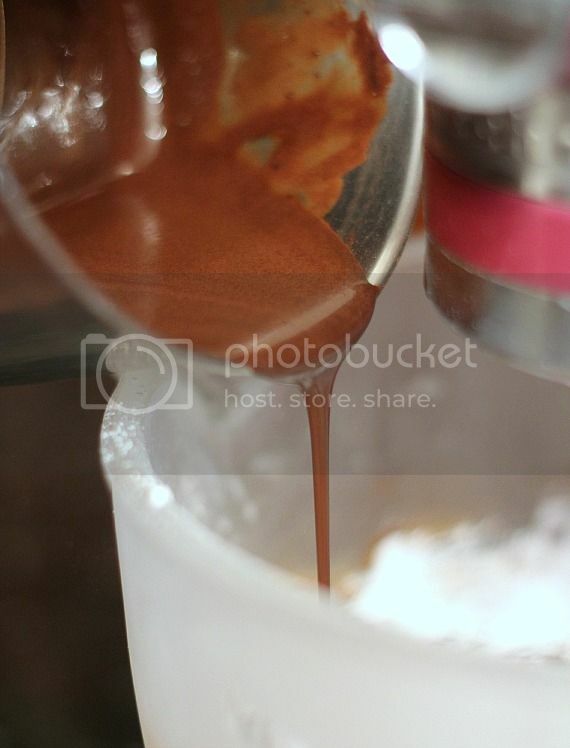 Just looking at that thick hot chocolate being poured into the mixing bowl is making me drool! Dude, I totally just got some gourmet hot chocolate mix and was wondering what I could do with it. This is going on the list! oh that looks good!!! And my kid keeps asking if its winter yet, we had light flurries Friday night and I could hardly get him to sleep he was so excited. Is there a Nobel Peace Prize for baked goods? If so, you totally earned it. These babies could bring about world peace, no problem. UUh its still 80 at my house… but this frosting looks delish! Oh my deliciousness! That frosting doesn’t even need a cupcake to go on, just give me a spoon. Anne @ Have a Cookie! 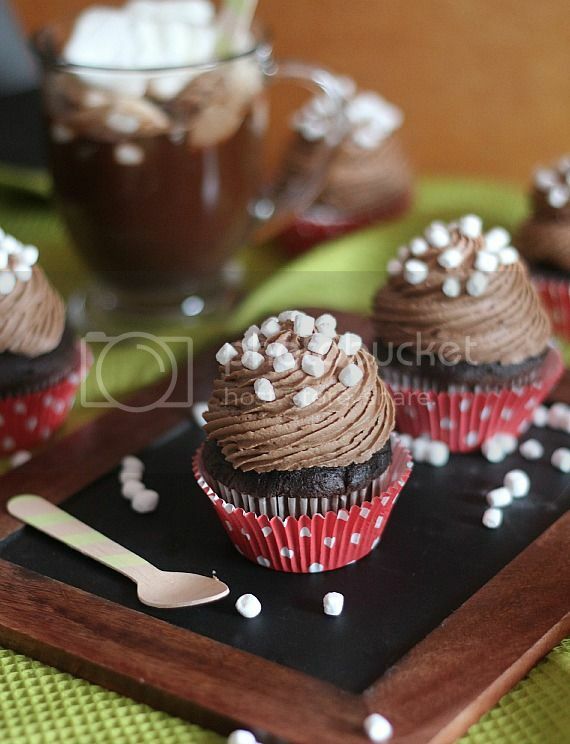 This looks divine and I like the idea of using the different flavored hot chocolate mixes. I don’t need a cupcake to put it on, just give me the bowl and a spoon!! That frosting looks pretty easy to make and very yummy! I like the idea of marshmallow bits-very cute! I don’t care what month it is…if it’s below 40 degrees then it’s winter. End.of.story. Which, coincidentally, means it’s hot chocolate season! Win!! Although…I vote that hot chocolate buttercream should be year-round. Yum! I love hot chocolate and this sounds delicious! And it’s hot here. Not very Christmas-y at all. Can’t use my fireplace when we are pushing 80. My mom told me once to use hot chocolate mix instead of cocoa powder and was like wtheck are you talking about?! Ever since I`ve been trying to figure out ways to use hot chocolate mix, but never though hard enough. This is a great idea! The tiny marshmallows just top it off (haha)! It was cold last week but today the weather is gorgeous…I want it to be cold to make these! Get all up in my face!!! oh my gosh, you are an incredibly talented frosting piper! lol. this frosting is so awesome! pinning it now. This looks to die for!! Hot chocolate anything is heavenly…but frosting never even crossed my mind. This is getting made ASAP. Pinned! Um, the end of the world? YIKES. Time to get baking! 😉 Love this idea for Frosting. You always have the best ideas… I always wish I came up with them first 😉 But I cant wait to try this now! Hot chocolate frosting?? Color me OBSESSED! Agreed, Thanksgiving marks the start of winter for all intent and purpose. Very creative idea, it must be so delicious. Perfect sweet for cold weather.I’ve featured this recipe on my blog, hoping that you don’t mind, but if you do, please contact me and I’ll remove it. All the best. Just made this frosting and it IS AMAZING!!! OH MY GOSH! Just made this today, and it’s fantastic! It was also my first attempt at making my own frosting, I was actually nervous to try it! But it turned out so good! I have plenty leftover (thought I would need double for the amount of cupcakes i had), now to make something to frost! SO glad you made it!! This looks incredibly yummy! Can’t wait for me and my daughter to try it!! Thanks for the recipe!! 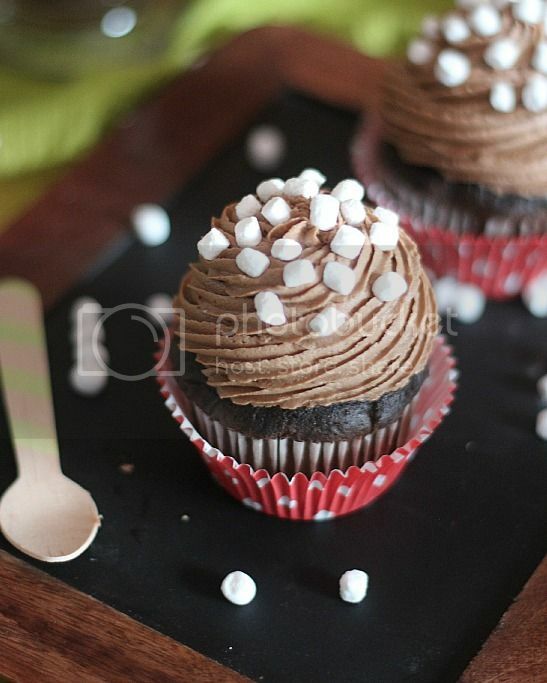 I think I will make mini chocolate cupcakes and put on a bunch of icing! Love the mini’s on top too!! Well, that’s odd. You can always add some more powdered sugar if it’s not thick enough! I just came across this recipe while trying to find a recipe to satisfy my sweet tooth with what we had on hand. This frosting is fantastic. I felt compelled to comment as many times people will say that a recipe “looks great” and “can’t wait to try it” but there are very few, if any, actual reviews after they’ve actually made it. I used a chocolate mocha Ghirardelli mix and topped some almond cupcakes with it. I may not make chocolate frosting any other way again. Thanks! I was making zuchhini brownies for a summer picnic and ran out of cocoa powder making them. I wanted to do a chocolate frosting with what I had-hot cocoa-and found this recipie. Thank you so much! The frosting was so beautiful and creamy, not to mention delicious, and I ground some milk chocolate to dust over the top. They were a hit!